I think it would speed things up if there were an option that could be toggled on and off to automatically vote for whatever the party leader votes for. The Assail ability allows you to move twice and then attack into an adjacent square. Suppose the player is on square 1, squares 2 and 3 are empty, and there is an enemy in square 4. The player elects to move through squares 2 and 3, then attack the enemy in square 4. If there is a hidden enemy in either of squares 2 or 3, what happens is that you bump the enemy, the movement is cut short, but you still successfully strike the enemy in square 4, which you are not adjacent to. It seems unfair to just lose the attack, although if that's the only workable option it would be preferable (and less weird). Ideally, after the player's movement is halted, they'd get a new attack selection highlight to pick a new target, or if the previously hidden enemy was the only available target, they'd attack them automatically. Either way, the way it works now doesn't really make any sense. As long as you haven’t scrolled up to view an earlier action, the activity log should scroll to the bottom automatically. If that’s not happening for you, could you add a comment with the browser version, OS, and device you’re using so that we can track down the bug? Thanks! It'd be nice if you could see like an organically growing timeline/flowchart of possible actions, highlight the action you want, then press next to grow the timeline further. Runestone of fiery retribution doesn't work. Runestone of fiery retribution doesn't activate when I get hit. I took a hit. I took damage. The rune is equipped, but nothing happens. Nearly pointless; you're nearly always better off going for an Off-hand + Main-hand combo (or better yet, Shadow Strike) when breaking stealth to attack. Doubly so when you get Stiletto. Only has limited niche use when under heavy pressure to attack quickly while stealthed (usually due to party members getting in trouble). Just make this a Passive which increases the damage of your stealth breaking attacks by +2, and has them impose Weakened on a critical in addition to their other effects, or a minor also usable as a major, at the cost of reducing its use to 1 / challenge. Benefit: Whenever you make a weapon attack while unnoticed, that attack deals +2 damage (or +25% damage, whichever is greater) and imposes the Weakened condition if it is a critical hit. Benefit: Whenever you make a weapon attack while unnoticed, that attack deals +4 damage and imposes the Weakened condition. Players should be able to grind experience, money, or at least consumable items through repeated questing. Why not, instead of just saying "try again," have some detailed description of what happens when you fall in battle. You know, something specific to that scenario. For example: You are felled by an Ash grue. Give some sort of description of the aftermath like in the old Fighting Fantasy games. Today, I was playing through all my Conclave turns, and my party came to a voting point. I clicked my vote, and it said it was voting, so after a second I clicked back to the party selection screen (without waiting for my vote to register). At that point I noticed that it still showed "Ready" for that party, so I thought, "Oh, my vote must have not gone through." I clicked back into it, and it said there was one vote for the option I'd picked. I clicked the option again, and it now registers two votes for that option, with the summary inlined with the choices showing me as having voted twice. 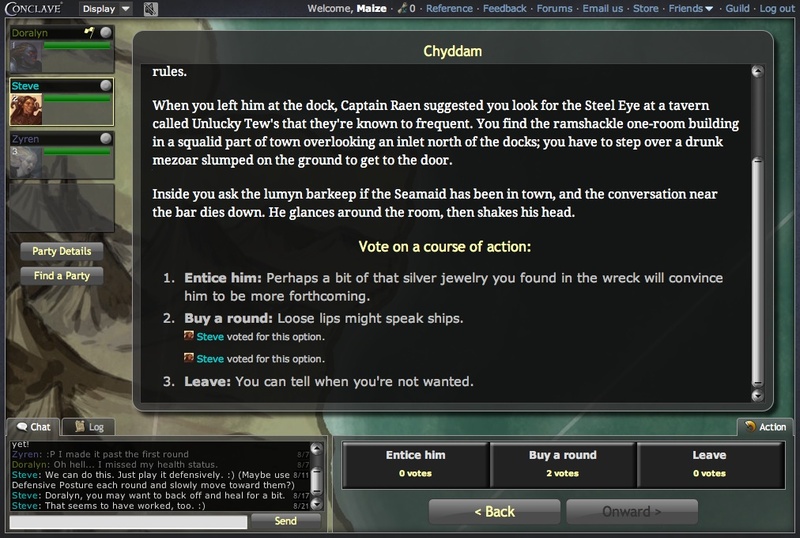 Use the Conclave engine and create other browser-based RPGs. Specifically, a WWII/French resistance-themed one and maybe one even more D&D-like. I'd like to say: "The possibilities are endless" but that'd be a platitude and I don't do those. An arcane ritual disrupts an enemy's place in the Concordance. Check Lore against the Will of an enemy within five squares. On a success, the target becomes Abjured and its focused, inspired and enraged positive conditions and buffs on it originating from an arcane ability are removed, dealing 3-6 Spirit damage for each positive condition and buff removed in this way. Undead, nightmares, magical and summoned creatures take 4-8 Spirit damage that ignores resistance and immunity. In this way RoA becomes actually worth using whenever enemy buffs and a certain subset of enemies are involved. Vs Undead, Nightmares and Summoned creatures: Disrupting the magic that comprises an enemy or binds them to the world deals damage. Vs Buffs/Emotional Conditions: Disrupting a target's Concordance ends their altered mental state, destroys their enchantments and results in proportionate psychic and spiritual feedback. I'd often like to listen to my own music while playing, or leave the Conclave tab open in my browser while doing other things (visiting YouTube, etc.). The persistent music is a problem in these circumstances. However, I'd still like to get the game sound effects. It would be cool to split these out into two mute buttons so you could mute just one or the other rather it being all or nothing. It would be great to have a way to easily jump through Round events. I often jump to the end for my turn, but sometimes I need to go back and review something that happened in a previous round (i.e., an enemy going invisible.). And quick way to jump rounds would be great, perhaps a slider... something more that < > arrows, especially for those events that accumulate 5+ rounds. Last enemy defeated it sometimes shows as still being alive. Subsequent story text boxes don't show up unless I log out and log back in. Allow the players to have a bit more interaction rather than just pick one of two options which both lead back to the same result. If your party is playing online together at the same time, you still receive email updates of what your party is doing. If I'm logged in to witness it, email is unnecessary. It would be nice if you only received email updates when you are not logged in. Most email updates are only sent if you haven’t been active in the game within the last 15 minutes, which has a similar effect. There are still a few that are sent no matter what, such as the notification we send when you kick off a quest. We’ll look into making those work the same way as the others when we have a moment.